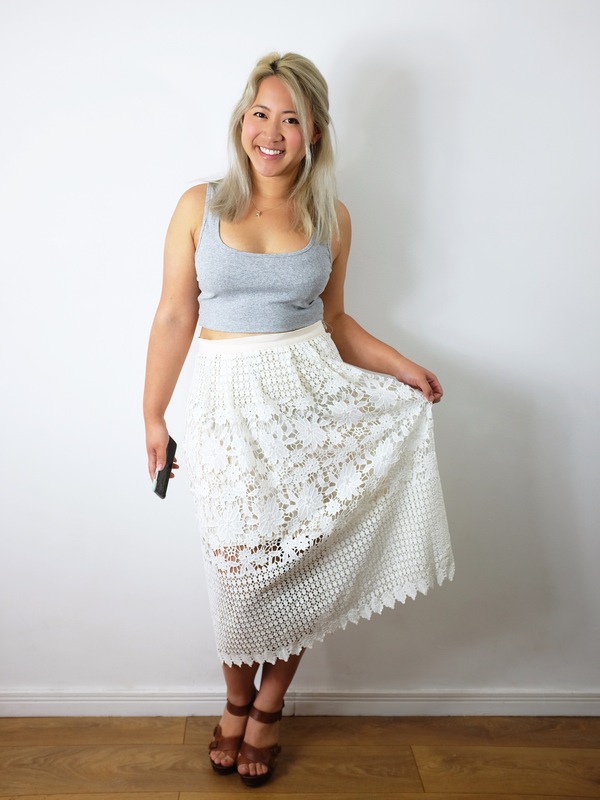 What better says summer that white crochet lace? I got a remnant piece from the Stitch Fabrics warehouse a few weeks ago. It was about 1.5 metres long and quite wide with the pattern repeating on both edges. It was gorgeous and only £8! I spent some time thinking about the best way to tackle this fabric. I definitely didn’t want to cut into it and realise I made a mistake! Mostly, I couldn’t decide whether I wanted to make it a fitted pencil skirt style or a high waisted pleated one. In the end I opted for the latter. I was thinking of a dirndl style skirt but with pleats instead of gathers – essentially a giant tube with pleats at one end and attach that to a simple waistband. Mostly because that meant that less cutting and fewer seams and considering that this is a bit of difficult fabric, that could only be a good thing. So my first thing to do was plan out a lining. I drafted a simple dartless A-line mini skirt with a centre back seam to allow a zip to be inserted. I also drafted a waistband to fit – just a simple straight band – which I interfaced. For the lace skirt I basically cut my piece of fabric through the middle lengthways. This meant I had one edge that had the finished crocheted edge which was going to be the hem of the skirt. I lined up the lining and the lace shell together, adding in pleats in even distances on the front and back, then attached that to the waistband. The waistband was then folded over and topstitched to contain all the seam allowances. I hand stitched the zip into the back. It needs some work to be honest but I’m happy with it for the moment. I wasn’t sure how else to close it! 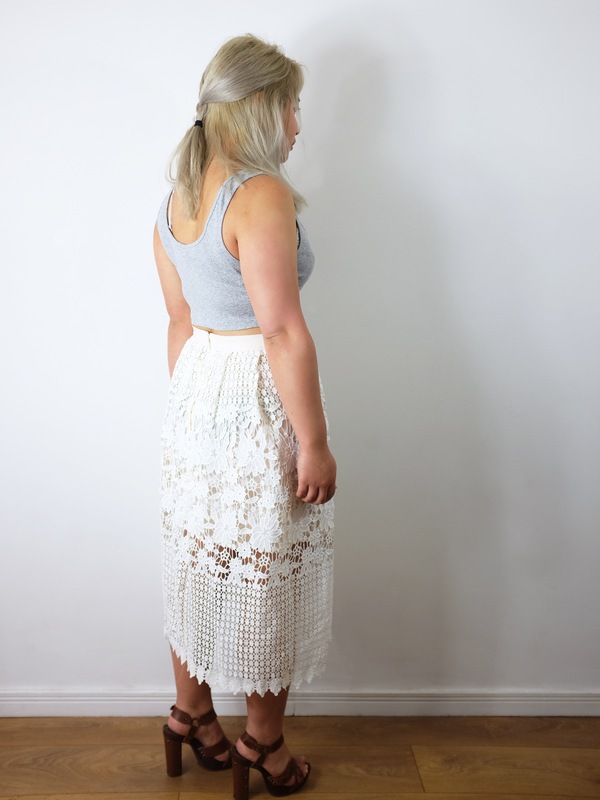 A midi skirt in a lovely lace with a beige miniskirt lining. It’s light and airy and has a romantic summer vibe going on. It’s relatively modest since the out later is quite long but you can get a little glimpse of leg underneath it! Beautiful skirt! I love the way you left the edge for the hem especially but that lattice look under the lining is altogether just gorgeous. That’s lovely…… so pretty. What beautiful fabric. 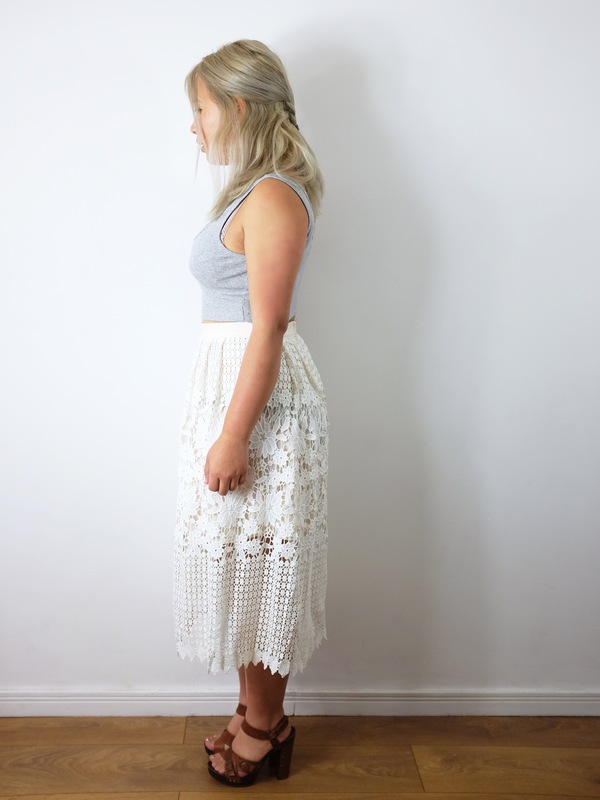 What a beautiful skirt, so perfect for summer. Brilliant use of that fabric!